Anyone can be a disc dog! Some people get revved up watching an amazing touchdown or their favorite player swing from the net in a game-winning slam dunk. Others get their blood pumping when the horses are in the back furlough and the announcer strains to be heard over the pounding hooves of magnificent beasts. Then there are those among us for whom dog sports rev our engines. Likewise, some dogs’ tails start thumping, hearts start racing, and muscles start quivering. They can barely contain themselves in the presence of their obsession. 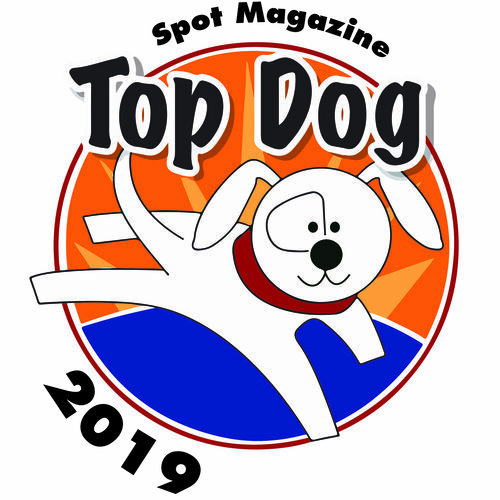 Spot received a YouTube video awhile back showing some amazing moves by a human/canine team showing their stuff in the thriving sport of disc dog. The dazzling duo is Oregon’s own Rich Roskopf and his Aussie/Viszla mix Makani, doing what they love best — playing Frisbee. Included in their jaw-dropping, acrobatic and energetic routine was a showstopper that surprised and thrilled the crowd. Going in a handstand, Roskopf flips Makani the disc with his feet. Makani catches it and sails beautifully into a backflip. All we can say is, “Wow….” Printed words can’t convey the excitement — catch the fun with your own eyes by watching the video. Roskopf can’t remember a time he didn’t love throwing a disc. He played ultimate Frisbee at Oregon State University and, when seeking others of like mind, especially people who enjoyed trying new moves as much as he did, he found the perfect partner: a dog. Having a canine partner proved the best of both worlds; Roskopf got to throw the disc and now had someone to bring it back. Makani was a natural jumper who came bearing some great stunt-dogging front and back flips. Roskopf adopted her from Oregon Dog Rescue and began the thrilling journey the pair continues to enjoy. Makani was not only a jumping, flipping fiend, but she was ball-crazy. Roskopf said it took time to get her interested in the disc, but by studying her ball obsession he was able to redirect it to the disc he favored. Allie is another rescue girl, from the Jefferson County Animal Shelter. An Australian Shepherd Labrador Retriever mix, Allie was a pleaser from day one, always keen to follow Makani’s lead. 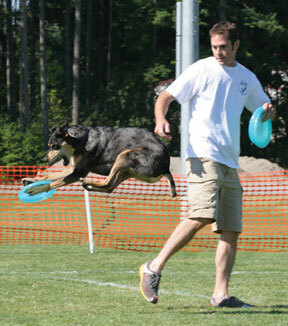 Roskopf thought the Frisbee would be a great way to exercise the dogs while allowing him to continue his beloved hobby. Rain or Pacific Northwest shine, Allie, Makani and Roskopf are out playing, running, chasing, and practicing their sport. The disc also serves other functions, says Roskopf, including strengthening the trio’s bond. If you’ve participated in training with your dog, you likely appreciate that while tools help with the work, perhaps the most important factor is the shared bond. “Sometimes I think I am training them to obey commands and more often than not, they are reminding me to just play,” says Roskopf. Rich Roskopf and Makani impress the crowd with their physical prowess. A dog doesn’t necessarily have an instinct for a disc. It isn’t an item from nature — something they’d instinctively seek, like a squirrel. A disc must be introduced, and some dogs need help recognizing its potential for fun. Roskopf notes that it’s important to develop some proper disc throwing skills before adding your dog into the equation. You’d don’t want to throw the disc in a way that could lead the dog into harm’s way. So what if your dog won’t give the disc a look, or acts like he has no clue what you expect? Try using it as a food and water dish. Baby steps. Start slowly and build. Once your dog is used to the disc being in his or her life, you can move forward. One thing Roskopf says worked for him was playing tug with it. That progressed to the dogs tugging and dropping it, then to carrying it while chasing him, to him rolling it along the ground, then flipping it straight up in the air. Once that became appealing it was a quick transition to throwing horizontally. Like most things, there’s no one-size-fits-all method. These are some ideas to get you started whether your goal is to just have fun with your dog, to meet other people, or to find a sport in which you can compete together. Makani and Allie’s dad says, “Playing disc with your dogs doesn’t have to be about you standing there and your dog chasing the disc.” He gets plenty of exercise playing with them — wrestling, playing tag, chase, and keep away. Roskopf’s background is in massage and movement therapy with a primary focus on biomechanics. So professionally he works to educate people to use their bodies efficiently. When it comes to dogs, he often finds they tend to learn best when steps are taken in easy, comprehensible bits. Paying attention to each of their natural abilities and focusing their training, moves, and using routines that showcase those characteristics goes a long way toward keeping the dog balanced, motivated, and happy. Dogs are excellent workout partners and playmates, and keeping them happy and healthy and accommodating their love of play is integral to the relationship. There are numerous resources about disc dogging online, including FLYDO (flydogoregon.com). From videos to pictures, training tips, and contact information for pros like Roskopf, FLYDO is a great site to learn more about this energetic, fun and creative sport. As is typical of dog-related sports, you’ll likely find people who are extremely helpful, willing to field questions, share tips, discuss strategy, and maybe even meet up for a workout. Currently, Roskopf is busy working on creative solutions to each of his girls’ challenges — such as maintaining team focus from a distance and turning styles. He’s also designing a freestyle routine for Allie, and of course just continuing to have fun. He hopes both dogs will again qualify for the upcoming World Championships. Like this story? See the video! 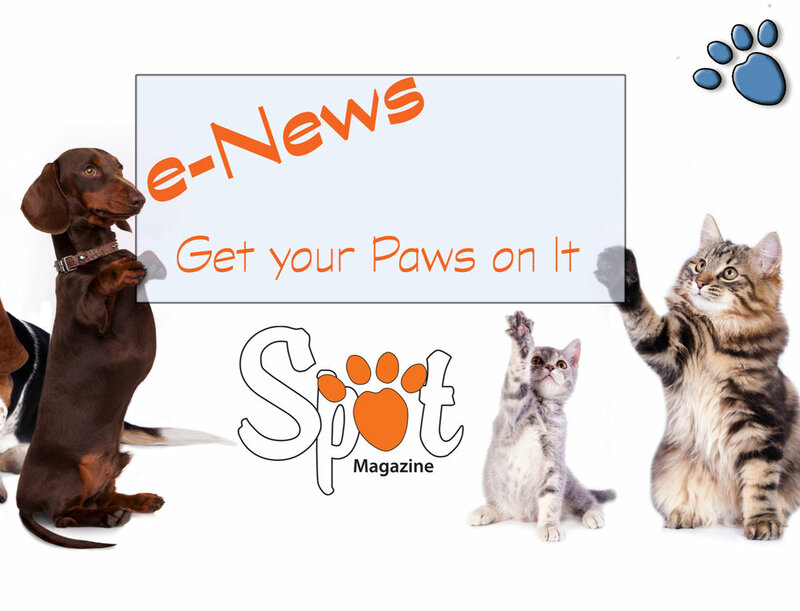 Posted in Feature, Life with Pets and tagged with Canine Games, Dog Sports, Exercise, Training, Video. March 1, 2012 by Kennedy Morgan - Spot Magazine.